The Beyond the Valley Studio Tour is over…..thank you everyone who came out and visited our studios. Old friends and new ones of which there were many, came by. My next event is my Christmas Open House the first week end of December. As well in November, probably the last half, I will again have pieces at the Small Works Exhibit at the Carnegie Gallery in Dundas. This exhibit lasts until Dec. 31. If you haven’t seen the new renovations at the gallery, do go. It looks great and much more spacious. And of course there is a lot of wonderful art to see as well and as usual. An article by Sarah Hampson in today’s Globe and Mail discusses Pearls….”never out of fashion. The ancients referred to pearls as the teardrops of the Gods. Today it is still the fashion to wear pearls to funerals as a sign of respect. 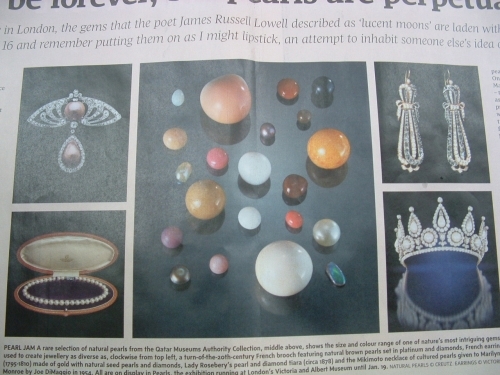 On contemporary celebrities, pearls can be an ironic wink to ladylike modestyin this age of indiscretion….Rihanna, Madonna, Angelina Jolie wear pearls…as did Marilyn Monroe.” Do read the article….lots of great information. And you will see pearls in many colours and designs….necklaces, bracelets, and earrings…..at my studio Oct. 19th and 20th, during the Beyond the Valley Studio Tour. Check it out and see what we are doing to get ready for the upcoming studio tour…..October 19 & 20. And I am still not thinking about turkey although I am expecting 22 people for Thanksgiving dinner. 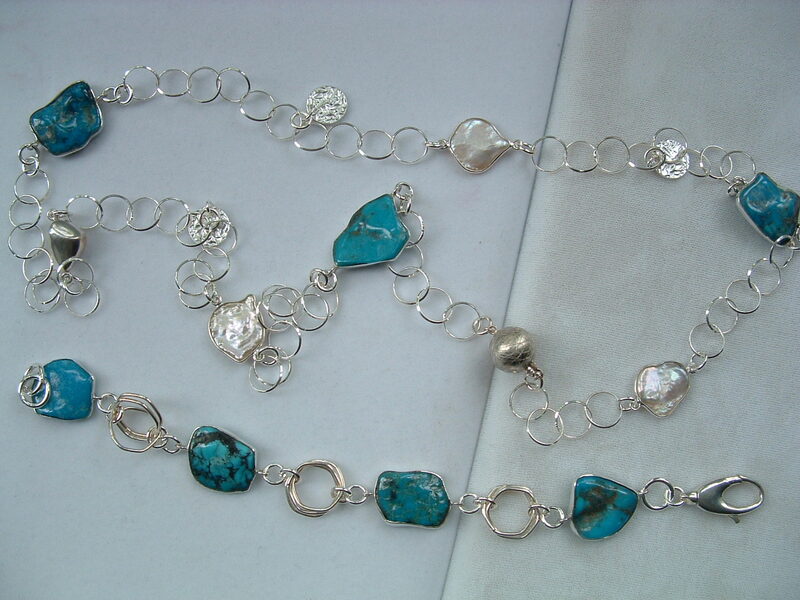 The image is of Arizona turquoise bezel set in sterling silver. The necklace also has bezel set freshwater pearls. The clasp in the necklace is decorative. Can you spot it? The tour is 13 days away – Saturday and Sunday, October 19th and 20th. Thanks to media sponsor URBANICITY for their support of the BEYOND THE VALLEY STUDIO TOUR. See their ad in our tour brochure, coming to you soon. URBANICITY IS Hamilton’s Premiere Urban Magazine- a monthly journal that is delivered to over 5000 households in the lower west city. Also available at many distrubution points. Check the website. URBANICITY delivers the grit and glory of city culture, business and politics in a unique black and white format. But the Beyond the Valley Studio Tour – Oct. 19th & 20th – is on my mind and not really turkey. 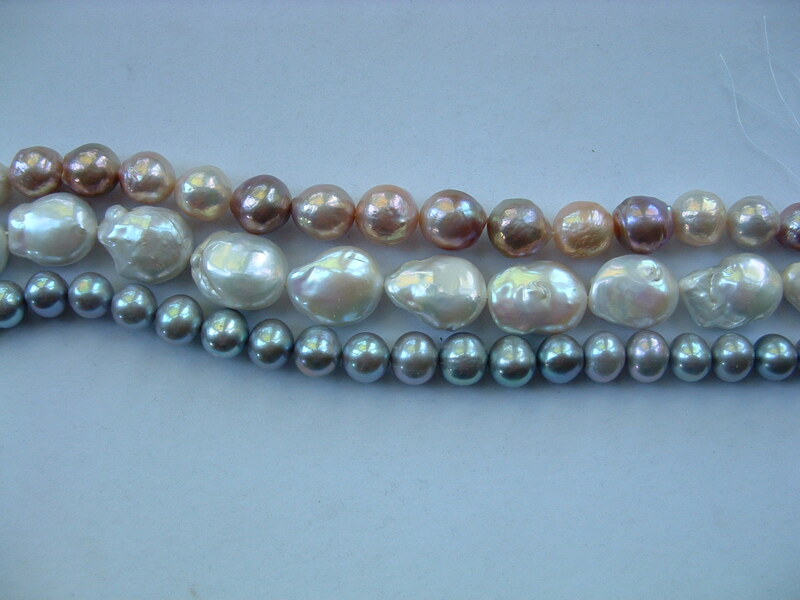 Pictured are 3 strands of Freshwater pearls…..and if you love pearls, you will love these. The grey pearls measuere about 11 mm., the whites are a somewhat flattened baroque shape and the top row is a fabulous strand of soft colours in graduated sizes with the largest approx 14 mm. 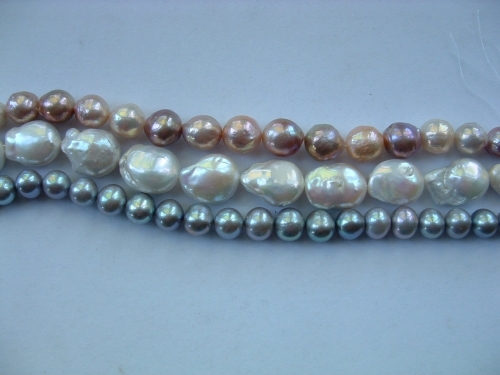 These soft colours are natural to these chinese kasumi pearls. which retail at $595.